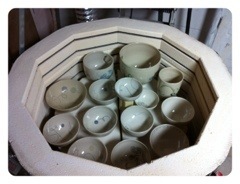 At 4:00 this morning I opened the final kiln for this year’s Maryland Sheep and Wool Festival. After waiting for the kiln to cool enough to wrap the pots for transit, without melting my bubble wrap, I got on the road. We made it all the way to Ohio, and we getting ready for some well deserved rest. The studio has been buzzing making lots of pottery, buttons, and stitch markers for this year’s event. I’m in the same location- you’ll find me in the farm and garden building, booth #8. (The farm and garden building is directly next to the t-shirt building.) Here’s a link to the festival grounds map. 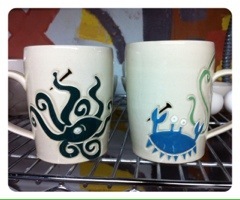 The blue crab has made it’s way back to the specialty mug for the event, and is joined by an octopus. I have a limited number of these, so come early to make sure you nab one! Also, if you have a project in need of a button, bring along your swatch or a sample of your fiber to help you locate the perfect match. This entry was posted in shows, studio on May 2, 2012 by Jennie.